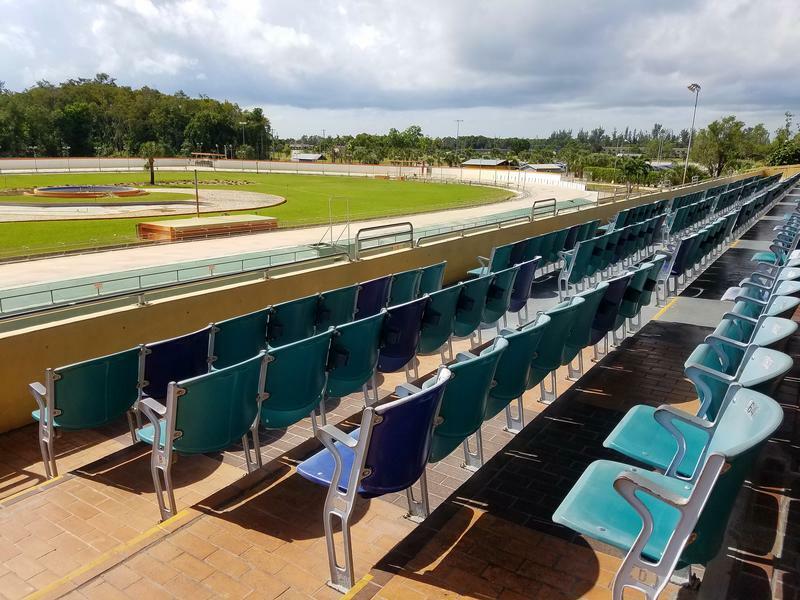 The dog track at Naples-Fort Myers Greyhound Track is completely empty. The venue hosts live races December through May. 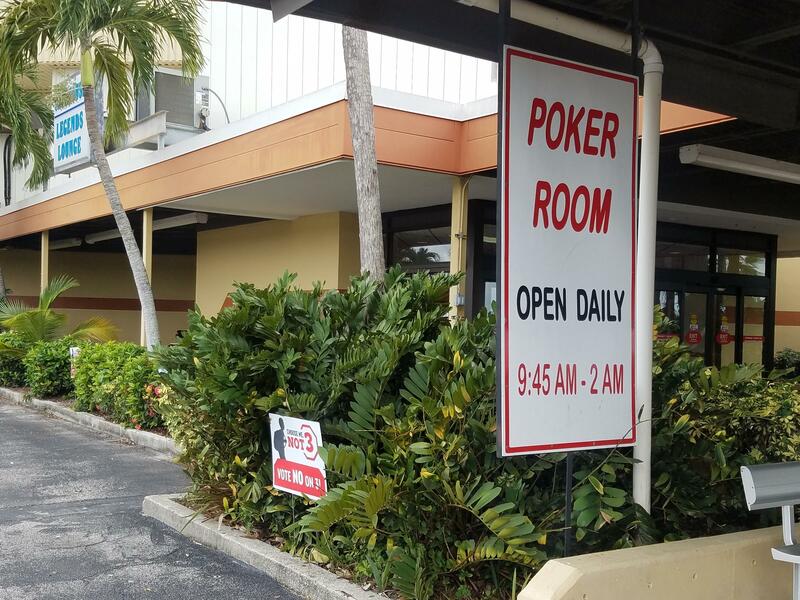 The Naples-Fort Myers Greyhound Track also has a poker room that runs year-round. The indoor area of the track has a card room that is open daily until 2 a.m. and shows simulcasts of dog and horse races every day. In order for card rooms to operate in Florida, they are required to have dog or horse racing or Jai Alai courts. Amendment 13 would end live greyhound racing in the state- while leaving the poker tables intact. The parking lot of the Naples-Fort Myers Greyhound Track in Bonita Springs held about 150 cars last Friday afternoon, but there were no dogs racing that day. Greyhounds only race in Bonita Springs during a season that starts in December and runs through May. Despite the absence of live dog racing, the atmosphere inside the building that hosts the track was lively. 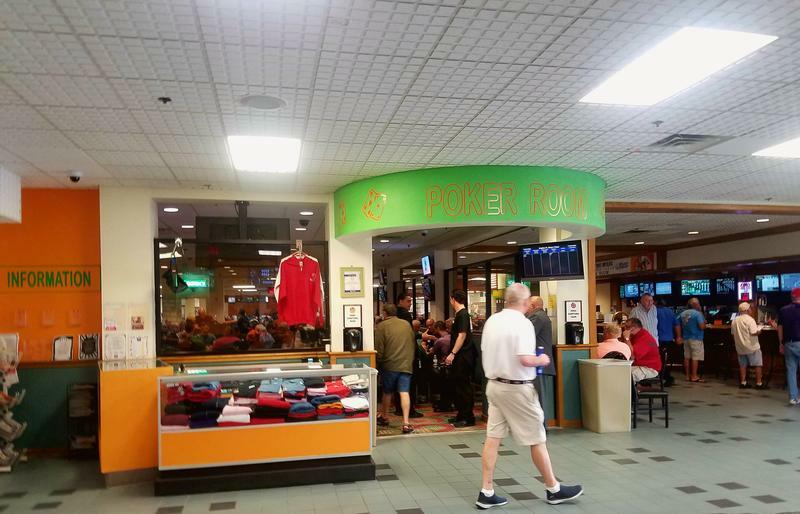 About a half dozen poker tables were filled with card players, ordering drinks and lunch items. Outside the card room, spectators gathered around about 100 tiny televisions that showed simulcast dog and horse races. The owner of the track has issued no comment on Amendment 13, which would ban greyhound racing in the state. The argument of whether or not the bill should be passed has revolved around the treatment of the dogs with some saying greyhounds get the best care possible, like pro-racing advocate Sharon Dippel. "Amendment 13 is what I call a ‘feel good amendment.’ It makes people feel good that they are going to help these greyhounds,” Dippel said. Others like Sonia Stratemann, say greyhound racing is inhumane. “Anyone that loves their dog would not put them out on a dog track knowing the huge risk of catastrophic injury,” Stratemann said. Stratemann has worked with retired racing dogs for years and claims that the dogs are mistreated, drugged, and frequently injured. “They’re running 45 miles an hour--they collide, they trip , fall, roll, they break their necks, they break their backs, they break their legs,” Stratemann said. Injuries aren’t reported to the Florida Department of Business and Professional Regulation, which oversees licensing for the tracks, but drug test results are. Of more than 37,000 urine samples analyzed last year from racing dogs, 81 were positive for stimulants like caffeine and cocaine. On the pro-racing side, another argument is that ending dog racing in Florida would close two-thirds of the tracks in the nation. According to a state report from 2017, the trend over the last decade has shown declining receipts. Since the fiscal year ending in 2008, the number of people paying to get into all pari-mutuel betting facilities in the state went from 1.4 million to 333-thousand last year. State income from pari-mutuel betting has dropped more than 57 percent in that time frame. A year and a half ago, Izzy Havenick, the spokesperson for the track in Bonita Springs, was quoted in an article by the Washington Post saying he welcomed the idea of dropping dog racing. But now that Amendment 13 will be placed in voter’s hands, Havenick said his organization takes no position and has no comment. What Havenick does want to talk about is Amendment 3, the other gambling proposal on the ballot. Amendment 3 would leave it up to Florida voters to decide when new casinos can get a license and where they can open in the state. Both gambling amendments would need approval by more than 60% of voters in order to become to become part of the state’s constitution. 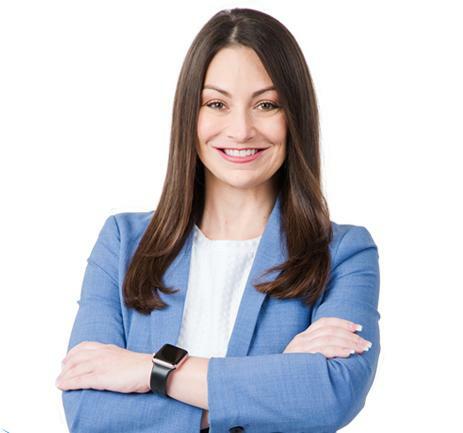 With the November 6 general election now less than a week away, we continue WGCU’s series of interviews with the Republican and Democratic nominees for public office in Florida in a conversation with Democrat Nicole “Nikki” Fried, who is vying to become the state’s next Commissioner of Agriculture and Consumer Services. Fried is an attorney and life-long Floridian who previously headed the Felony Division of the Alachua County Public Defender’s Office. In the private sector, she also worked on behalf of Florida homeowners facing foreclosure during the housing crisis a decade ago. In more recent years, Fried has been working as a lobbyist on behalf of the medical marijuana industry in Florida. Fried’s campaign marks her first attempt at holding public office and she’s the first woman from either major party to receive a nomination for the Commissioner of Agriculture and Consumer Services position. In this interview, Fried talks about her background and qualifications and the priorities in her campaign platform including: addressing water quality and harmful algal blooms, helping the state’s beleaguered citrus industry, implementation of Florida’s medical marijuana industry, developing a hemp industry in the state, regulation of firearms and cracking down on fraudsters that prey on vulnerable residents. Fried faces Republican Matt Caldwell in next week’s election. You can hear our conversation with him here.